Here’s a tasty bread alternative I knocked up for lunch (inspired by some friends experimenting with the keto diet)! 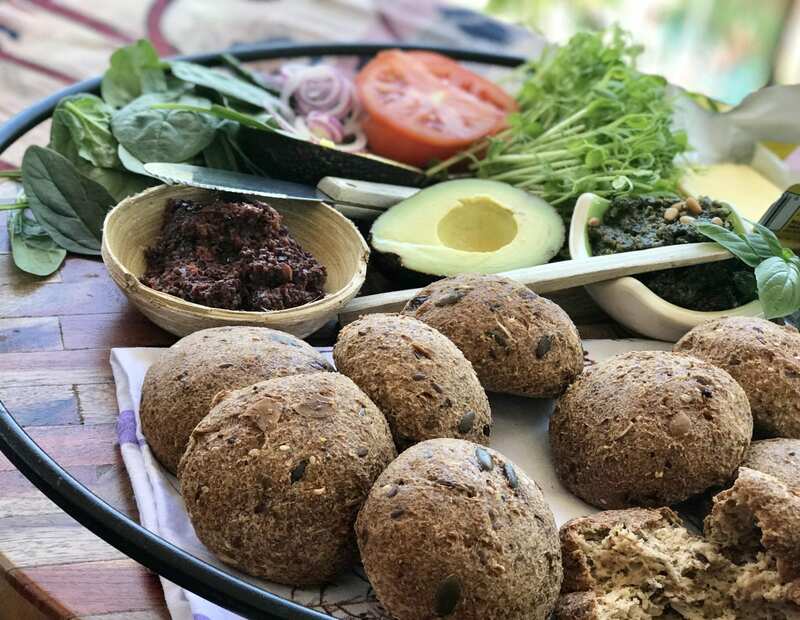 These keto bread rolls are gluten free, sugar free, high in protein & good fats, with plenty of fibre, minimal carbs & (best part) they actually have great texture & taste awesome with anything you’d normally have with bread! Keto friendly, diabetic friendly…seriously, you should make these! This super easy recipe will make you a dozen buns just smaller than a tennis ball (let’s say handball sized buns!?) Perfect for lunches or using anywhere you’re craving a bread-type product. Add your own extras – could be mixed spice & orange zest for a hot cross bun kinda feel, olives & rosemary would be amazing…semi-dried tomato / parmesan / etc etc…& an egg-free vegan adaptation would be no problem – just use soaked chia or flaxseed as the egg replacement. These babies ended up as a low carb lunch platter with some salad, fresh pesto, butter, olive tapenade, & avocado! Total hit. 1. Preheat oven to 175°C. Mix dry ingredients in a large bowl. 2. Boil water and add it, the vinegar and egg whites into bowl, whilst beating with a hand mixer for about 30 seconds. Don’t over mix dough, consistency should be similar to Play-Doh. 3. Moisten hands and make 12x handball sized buns. Place on a baking paper lined oven tray. 4. Bake on lowest shelf in the oven for 90 minutes. They’re ready when nicely browned & you can hear a hollow sound when you tap the bottom of the bun. 5. Serve with butter / toppings of your choice.